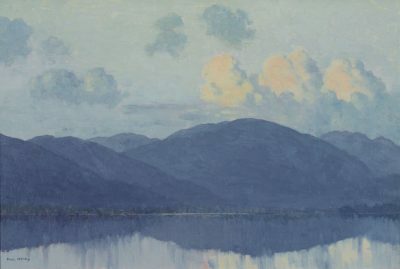 Belfast born painter Paul Henry has been credited with the creation of a particular notion of Irish identity in the 20th century, based on the landscape and lifestyle of the West of Ireland. Henry worked as an illustrator in London until a visit to Achill Island in 1910 inspired him to turn to painting. Henry's paintings of Achill provided an image of Ireland that perfectly fitted the aspirations of the first post-independence governments. He moved to Dublin in 1919 and co- founded the Society of Dublin Painters in 1920. The National Gallery of Ireland held a major exhibition of Henry’s work in 2004.